The Standard Z-cap is an axial-type capacitor made from Metallized Polypropylene and specifically manufactured for audio applications. Special attention to winding technique has resulted in enhanced control of microphonics which allows the Standard Z-Cap to outperform many higher priced competitor products. Jantzen Capacitors and Foil / Signal direction. 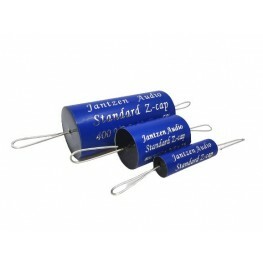 All Jantzen crossover capacitors are non-polarised. This means they can be wired in either direction without any harm. Some believe that capacitors do exhibit improved sonic character when the signal enters the end with the inner foil. For the Superior, Silver, and Alumen Z-Caps the inner foil end is always to the left (When reading left to right). So the signal 'in' would be from the left (inner foil), and 'out' would be to right (outer foil). For the Cross-caps and Standard Z-caps the inner and outer foil changes from production batch to production batch. So without individual testing there is no way to know which is the 'in' or 'out' lead. 1uF MKP Polypropylene Standard Z-Cap. 400Vdc Tolerance 5% Dimensions; 11 mm Dia 32 mm L ..
1.2uF MKP Polypropylene Standard Z-Cap. 400Vdc Tolerance 5% Dimensions; 10 mm Dia 31 mm L ..
1.5uF MKP Polypropylene Standard Z-Cap. 400Vdc Tolerance 5% Dimensions; 13 mm Dia 32 mm L ..
1.8uF MKP Polypropylene Standard Z-Cap. 400Vdc Tolerance 5% Dimensions; 14 mm Dia 32 mm L ..
2.2uF MKP Polypropylene Standard Z-Cap. 400Vdc Tolerance 5% Dimensions; 14 mm Dia 32 mm L ..
2.7uF MKP Polypropylene Standard Z-Cap. 400Vdc Tolerance 5% Dimensions; 16 mm Dia 32 mm L ..
3.3uF MKP Polypropylene Standard Z-Cap. 400Vdc Tolerance 5% Dimensions; 17 mm Dia 32 mm L ..
3.6uF MKP Polypropylene Standard Z-Cap. 400Vdc Tolerance 5% Dimensions; 17 mm Dia 32 mm L ..
3.9uF MKP Polypropylene Standard Z-Cap. 400Vdc Tolerance 5% Dimensions; 19 mm Dia 32 mm L ..
4.7uF MKP Polypropylene Standard Z-Cap. 400Vdc Tolerance 5% Dimensions; 21 mm Dia 32 mm L ..
5.6uF MKP Polypropylene Standard Z-Cap. 400Vdc Tolerance 5% Dimensions; 22 mm Dia 32 mm L ..
6.8uF MKP Polypropylene Standard Z-Cap. 400Vdc Tolerance 5% Dimensions; 24 mm Dia 32 mm L ..
8.2uF MKP Polypropylene Standard Z-Cap. 400Vdc Tolerance 5% Dimensions; 21 mm Dia 47 mm L ..
10uF MKP Polypropylene Standard Z-Cap. 400Vdc Tolerance 5% Dimensions; 22 mm Dia 47 mm L ..
15uF MKP Polypropylene Standard Z-Cap. 400Vdc Tolerance 5% Dimensions; 25 mm Dia 57 mm L ..
18uF MKP Polypropylene Standard Z-Cap. 400Vdc Tolerance 5% Dimensions; 26 mm Dia 55 mm L ..
22uF MKP Polypropylene Standard Z-Cap. 400Vdc Tolerance 5% Dimensions; 28 mm Dia 62 mm L ..
33uF MKP Polypropylene Standard Z-Cap. 400Vdc Tolerance 5% Dimensions; 35 mm Dia 62 mm L ..
47uF MKP Polypropylene Standard Z-Cap. 400Vdc Tolerance 5% Dimensions; 43 mm Dia 60 mm L ..
56uF MKP Polypropylene Standard Z-Cap. 400Vdc Tolerance 5% Dimensions; 45 mm Dia 65 mm L ..
68uF MKP Polypropylene Standard Z-Cap. 400Vdc Tolerance 5% Dimensions; 47 mm Dia 70 mm L ..
82uF MKP Polypropylene Standard Z-Cap. 400Vdc Tolerance 5% Dimensions; 41 mm Dia 90 mm L ..
100uF MKP Polypropylene Standard Z-Cap. 400Vdc Tolerance 5% Dimensions; 46 mm Dia 90 mm L ..